Welcome to the new Fort Garry Regimental Association KitShop website. We have updated our site to offer a great experience for all of our visitors. The website’s “SHOP” now includes over 70 items for sale from the necessary items that a soldier needs to be properly outfitted, to those special collectables that may be wanted by our retired soldiers and family. We have expanded our “SHOP” offerings for both The Fort Garry Horse and The 31 Engineer Squadron. The “ASSOCIATION” category will now process memberships, donations to the Association and supported projects. 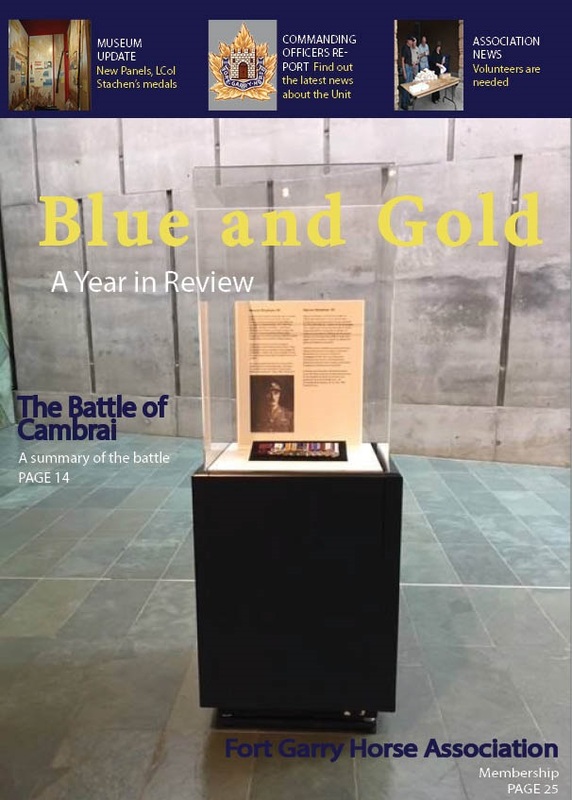 The ‘NEWSLETTER & BLOG’ section will contain regularly updated reports and the Association Newsletter: The Blue & Gold. This website would not have become a reality without the help from the following dedicated individuals; Steve T., our computer and software expert, Stan B., our WW2 Veteran who spent months working with myself on the product pages and the general setup, Brynn H., our Word Press expert without whom we would never have gotten the site fully operational. To all, my thanks and great appreciation for all your efforts. The following is a summary of the story of the Battle of Cambrai as told by Lieutenant-Colonel Harcus Strachan V.C., M.C. LCol. Strachan V.C. served with the Fort Garry Horse during WW1 from 1915-1918 and was awarded the Victoria Cross for his actions and extraordinary valour during the Battle of Cambrai. Ten decades ago, in the year 1916, tanks made their first appearance with a design crafted specifically for traveling over rugged terrain while carrying heavy machine guns. Their arrival would have a great impact on the outcome of the Battle of Cambrai. At that time, the infantry’s numbers were limited, and no deliberate plan had been constructed. The tanks had the job of delivering a surprise attack — a task previously delivered by massed artillery. On November 20, 1917, the German line would be broken. “B” Squadron of the Fort Garry Horse, commanded by Captain Duncan Campbell M.C. was ordered to continue independently to German Corps Headquarters at Escadouvres. Their job was to impound the personnel, destroy records and communication, and rejoin their brigade. The attack was successful, and by noon, tanks and infantry had infiltrated the town of Masnieres. The greatest resistance they experienced knocked out about sixteen tanks. Once the center of the town had been reached, it was discovered that the only bridge across the canal had given way under the weight of a tank. An alternative route for the Squadron was found across a lock gate to the east, and after crossing there, another challenge presented itself. Camouflage netting was protecting the entirety of the road and halt was made to cut a way through. From that point on, the Squadron proceeded in columns. At one point in the operation, The Squadron was confronted by a German artillery battery. They had been specifically ordered not to engage, but the opportunity was too good to miss. The battery was successfully overrun, and the Squadron reassembled and continued to the objective. Severe casualties had been suffered, but success was not far out of reach. Although the enemy was surrendering on all sides during the early part of the engagement, occasionally, additional casualties were suffered due to machine gun fire from both wings and the rear. B Squadron numbers had been reduced from 150 to about 50. Many remaining horses were wounded and losing strength quickly. 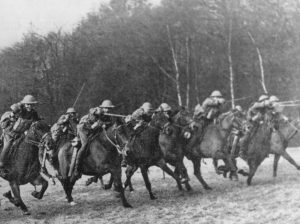 There was no sign of the troops advancing; an all-around defence against attacks by German infantry, which were in turn beaten off. By 4:30 p.m., it was obvious the progression of the brigade had been interrupted and that their strength was inadequate for the fulfillment of the mission. A group of about 40 members with fixed bayonets and orders to attack set out. The enemy was unaware of their presence and purpose. One officer was wounded, but many casualties were suffered on the enemy’s side. A body of two officers and eight other tanks drove the enemy eastward along the road. They were cut off; the Squadron would be returning in two groups. The larger group was under command of Lt William Cowen. The groups had been separated in the dark, and Cowen’s group arrived back at Brigade HQ first, assuming that all Strachan’s group had been lost. The smaller force succeeded in reaching the eastern periphery of the village of Masnieres, and on November 21st, successfully crossed the canal. Strachan’s group arrived back at HQ very early on the 21st, having hidden in a basement in Masnieres for a while, to the great relief of the CO.
43 soldiers returned out of a strength of 150. The members of the Squadron that had remained intact were in action again on December 1st at Chapel Crossing and Gauche Wood. The young Canadians’ performance was a prime example of ability and endurance in challenging situations. Although the main objective was not executable, their perseverance was an exceptional example of how these types of operations should be carried out, and it had direct connection to the winning of the War. 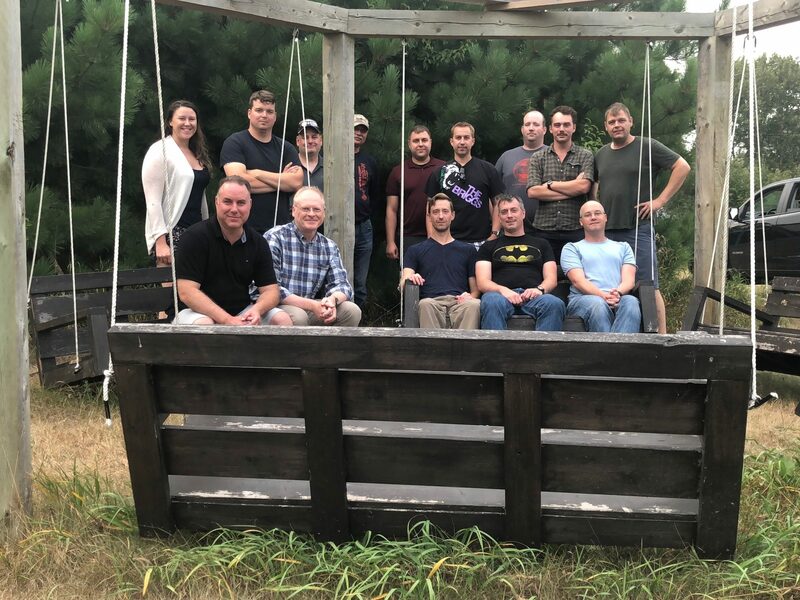 The Fort Garry Horse held its 2nd Annual Leadership Weekend on 25-26 August at WO Taylor Warren’s property 90 km south of Steinbach. The beautifully treed property, with no neighbours to disturb and no cell phone reception to interrupt, provided the ideal setting for planning and professional development, for the leadership of the FGH. Specifically, in attendance were the officers and SNCO’s of RHQ, HQ Sqn HQ, A SQN HQ, Troop Leaders, Troop Warrants and Troop Sergeants. The focus of this year’s Leadership Weekend was ‘communication to the soldiers’, which included the unit’s training plan, individual and troop expectations, and commitment to training. The weekend kicked off with an AAR of last year’s training year; where each soldier in attendance provided one example of what his/her organization did well, what needs to improve, what they would like to see happen and one concern for this year. Overall, this led to spirited suggestions for improving and perfecting the training of our soldiers. After the AAR, officers and SNCO’s divided into groups to discuss and prepare presentations to address questions, such as: what is the CO’s goal, what is my goal and what is our style of leadership—topped off with a moral and team building motto for the year. After a solid day of planning, the day’s activities ended with barbecued hamburgers and smokies, a bonfire and many war stories over cold cans of refreshment. The next day, attendees were treated to bacon stuffed croissants, instant coffee, and sent on their way home. The success of the weekend arose from the ideas and conversations by all who attended, who all volunteered to be there without pay and truly embodied the deeds and the words that will add to the success of this training year.